Donald Duck always creeped us out a little. In fact, save for Pooh and Pals, none of the Disney toons had much appeal to us; we’re firmly in the Warner Brothers camp when it comes to classic animation. But the Duck deserves a stick tap for his willingness to skate and to coach his nephews on frozen pond. 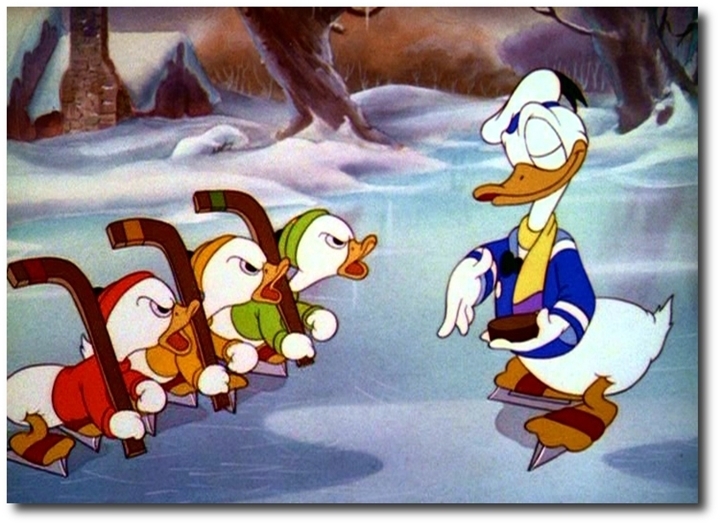 In this 1939 short, ‘The Hockey Champ,” the feathered foursome takes to the ice, and as the IMDB abstract says, “Donald shows his nephews the moves that won him his hockey trophy. But the boys have a few moves of their own.” That synopsis sounds creepily like some ‘educational films’ we’ve heard about. And seeing the Donald do a drag bit as Sonja Henie doesn’t make this look any less awkward. Owing to Disney’s worldwide reach, the cartoon was dubbed into several languages and is also knows as: Champion de hockey (France), Der Hockey-Champion (Germany), El campeón de Hockey (Argentina), Jääkiekkosankari (Finland), and Kalle Anka spelar ishockey (Sweden). And now, without any further ado, it’s showtime! This entry was posted in Uncategorized and tagged Is it October yet?, Saturday Morning Cartoons. Bookmark the permalink. hes not wearing pants…. ftw!